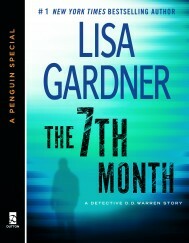 In Lisa Gardner’s first-ever short story following thirteen bestselling novels, The 7th Month takes readers between the novels and into a day in the life of Boston Detective D.D. Warren. In her seventh month of pregnancy, D.D. should be taking it easy. Instead, she accepts a small consulting role on the set of a serial killer film shooting in Boston. D.D. figures she’ll be useful to someone for at least one night, serving as a police expert and making a little extra money in the bargain. A simple task, until a member of the crew, a former Boston cop, is found beaten to death. Suddenly, D.D.’s date with Hollywood gets serious. Extremely pregnant, on the trail of a killer, surrounded by a hundred and four murder suspects in the middle of a graveyard, D.D. must quickly unravel a tangled web of lies. As another cast member is attacked, D.D. realizes that like it or not, her priorities have changed – and her last desperate hope is that she can catch a killer before she and her unborn baby face mortal danger. Packed with the suspense storytelling that has turned Gardner’s novels into New York Times bestsellers, The 7th Month reveals new insights into a beloved series heroine. Includes an exclusive early look at Catch Me. Available in ebook format now. "A must read for everyone, especially if. . .getting inside the killer's head. . .is in your job description." "A fast, quick moving story. . .filled with suspense."